Hello artists! Don’t let this deadline slip you: Smack Mellon, the cool DUMBO-based art gallery, is accepting applications for their artist program until November 2. What is the program? And, what do you get? The program provides six eligible artists working in all visual arts media a free private studio space accessible 24/7 and a fellowship (dependent on funding). The program runs for an eleven-month period from June to May. Artists also have access to shared facilities that include: a state-of-the-art digital production lab, MAC work stations, scanners, photo printers, wi-fi, a fabrication shop and tools, hand tools, welding equipment, and more. Note: Artists who are accepted into the program must be prepared to actively use their studio a minimum of 50 hours a month or they will lose it. 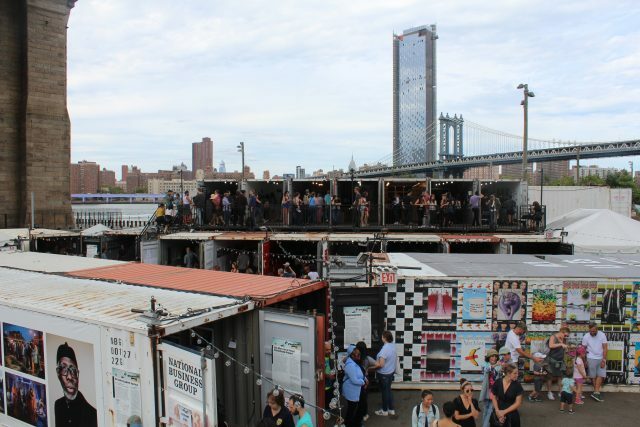 Photoville houses its exhibits in refurbished shipping containers. Photoville returned for its seventh year, transforming the plaza beneath the Brooklyn Bridge into a myriad of temporary photo exhibitions stringed alongside the Brooklyn Promenade in DUMBO. 1. More than just photographs. 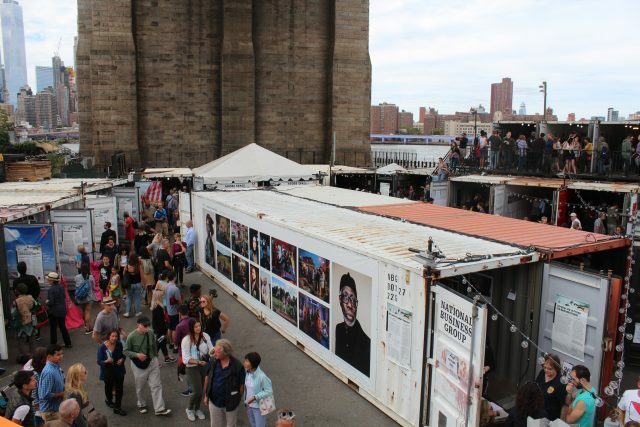 The free nine-day festival, by way of United Photo Industries, is known for its repurposed shipping containers that house the temporary photo exhibitions in a makeshift photo village. The year-round effort compiles the work of artists from all over, and curates this effort into thought-provoking exhibitions featured in Brooklyn Bridge Park. Photoville takes place under the Brooklyn Bridge. Outdoor screenings, hands-on workshops, discussion panels, an education day for New York City students, and a Smorgasburg-sponsored beer garden were also thrown into the nine day mix. Featured programming included sessions hosted by the New York Times, New York Magazine, National Geographic, Getty Images, and PBS POV. 2. It may be free, but it should cost more. Photoville is free for the public to attend, but the work invested into Photoville’s fruition arrives with a cost: this year’s price tag clocked in at $650,000. And that’s actually not that much for what’s being offered, according to Laura Roumanos, executive producer at United Photo Industries and co-founder of Photoville. It’s a year-round effort to curate all of Photoville’s exhibits. The grit of Roumanos and the rest of the United Photo Industries team is what feeds Photoville’s vitality — along with its 150+ sponsors and the donations that it receives. Each year, the photography festival witnesses generous growth. 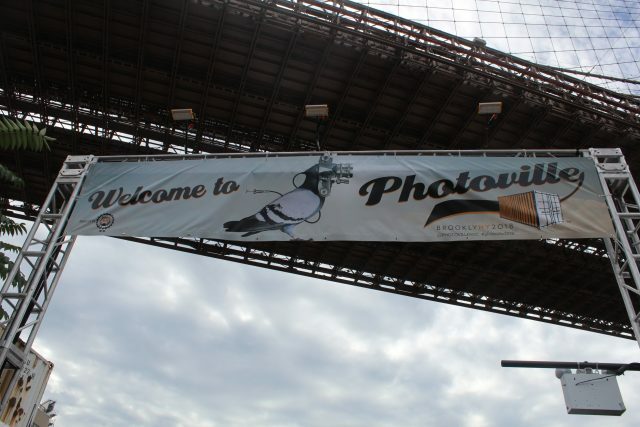 Around 40,000 visitors frequented the 40 exhibitions of Photoville in 2012. Photoville is dwarfing its own numbers six years later, with a record attendance of 90,000+ visitors that were ushered in to gaze upon over 80 exhibitions. “We’re the definition of the hustle,” Roumanos commented. 3. You can see the exhibits across the country. Though the show is grounded in Brooklyn, the festival has extended out into other locations including Boston, Atlanta, Durham, Denver, Santa Fe, Houston, Sacramento, and even into the Canadian terrain of Calgary. In an ongoing effort to increase diversity, many of the exhibits from this year featured female subjects, female photographers, and people of color. Photographs highlighting the hardships of immigration and gentrification were also central in the seventh iteration of Photoville. Photoville is “for everyone, and I mean everyone,” Roumanos said, who plans to continue her work in providing a platform for unheard voices. Down the road, she says that Photoville could see an influx of interactive exhibitions, an increase in family-oriented showcases, and further involvement with youth organizations.